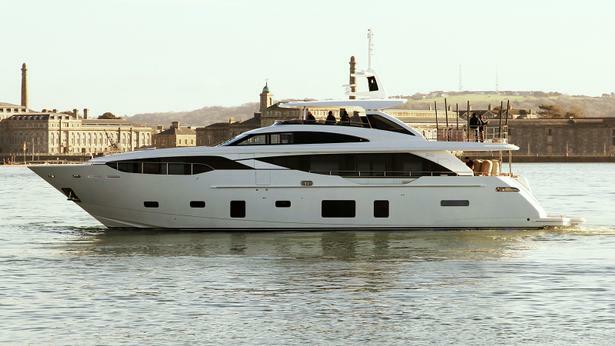 The 30.45 metre motor yacht Princess Three has been delivered, her builder Princess Yachts has confirmed. Key features include a spacious superyacht sundeck, which has been fitted with the optional spa pool, making this area ideal for al fresco relaxation. Her interior décor is described by the yard as “timeless and contemporary, offering relaxed, yet sophisticated living”. Built from a GRP hull and superstructure, Princess Three features a beam of 7.05 metres and a maximum draught of 2.06 metres. Power comes from a pair of 1,900hp Caterpillar C32 ACERT diesel engines, which allow for a top speed of 22 knots, as the Princess team confirmed on sea trials shortly after her December launch.